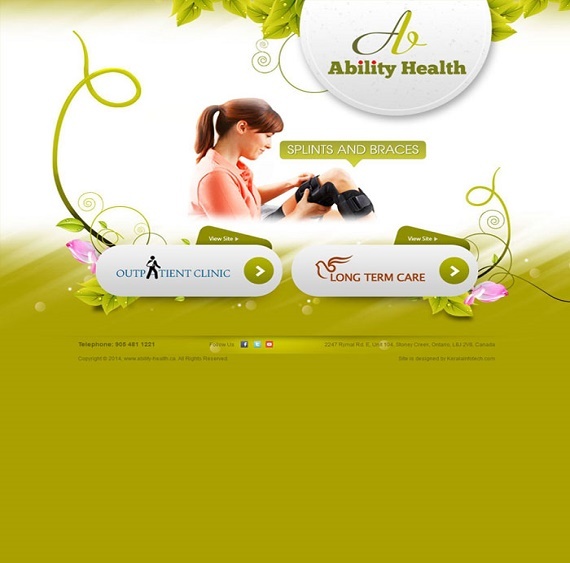 Ability Health Physiotherapy is a well-equipped, diversified and reputed clinic in the greater City of Hamilton, owned and operated by registered Physiotherapists. Rooted in the Love of God and in fear of is Omnipotence "Charity" is essentially a vision- a vision which inspires a pure minded and whole hearted way of looking at the spectacle of life with love for all and malice towards none; it is basically an attitude of mind - an attitude which inspires one to think the best thoughts and to do the best deeds towards glorifying the Almighty Creator's name. 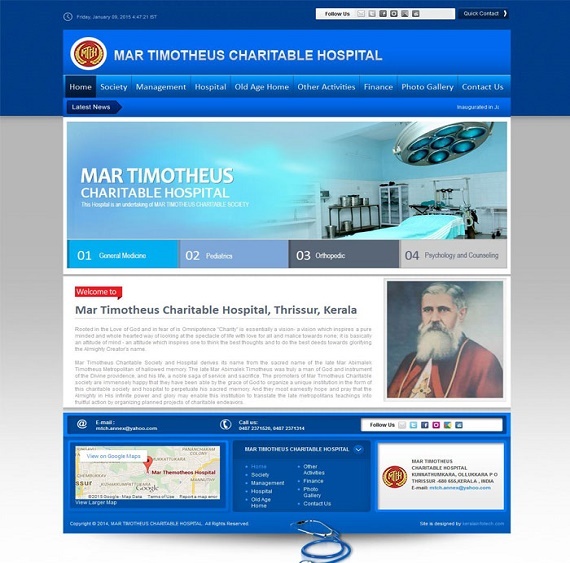 Mar Timotheus Charitable Society and Hospital derives its name from the sacred name of the late Mar Abimalek Timotheus Metropolitan of hallowed memory. The late Mar Abimalek Timotheus was truly a man of God and instrument of the Divine providence, and his life, a noble saga of service and sacrifice. 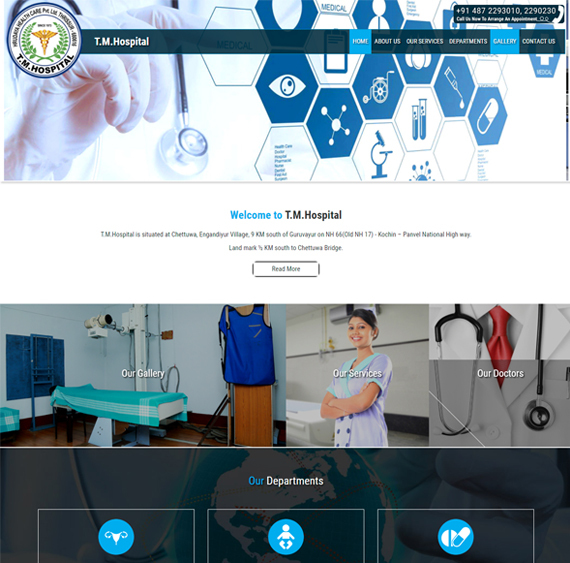 The promoters of Mar Timotheus Charitable society are immensely happy that they have been able by the grace of God to organize a unique institution in the form of this charitable society and hospital to perpetuate his sacred memory. And they most earnestly hope and pray that the Almighty in His infinite power and glory may enable this institution to translate the late metropolitans teachings into fruitful action by organizing planned projects of charitable endeavors. 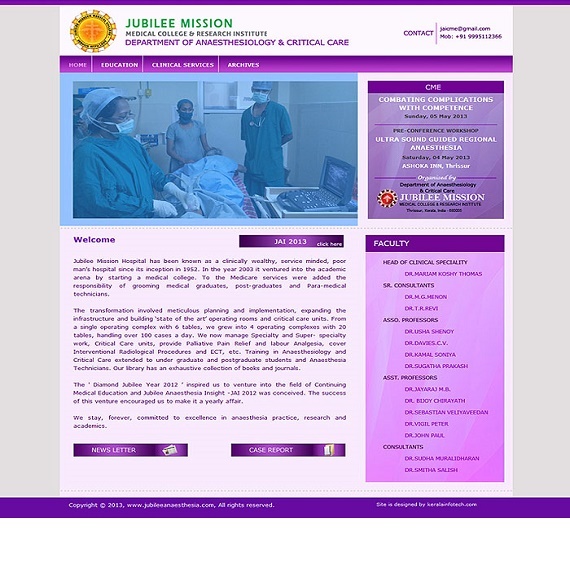 Jubilee Mission Hospital has been known as a clinically wealthy, service minded, poor man’s hospital since its inception in 1952. 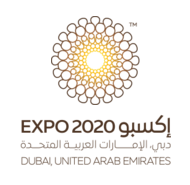 In the year 2003 it ventured into the academic arena by starting a medical college. To the Medicare services were added the responsibility of grooming medical graduates, post-graduates and Para-medical technicians. 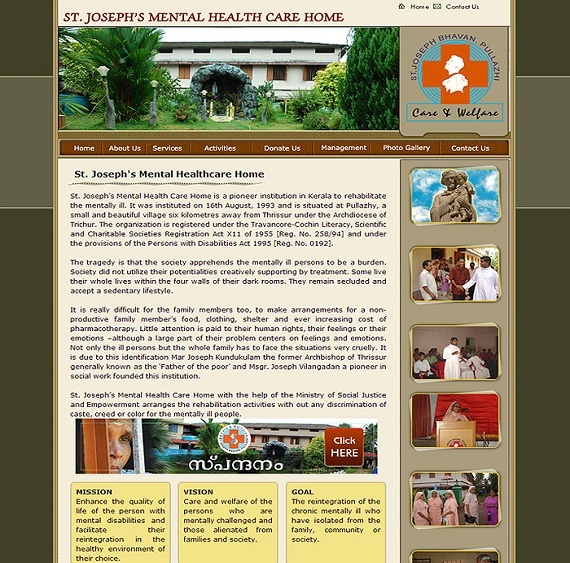 St. Joseph’s Mental Health Care Home is an institution to rehabilitate the mentally ill persons. This is the pioneer of this sort in Kerala. It is Instituted in 16th August, 1993 by Mar Joseph Kundukulam the former Archbishop who is generally known as the “Father of the poor”. The Co Founder of this institution is Msgr. Joseph Vilangadan a pioneer in social work and charity based activities in Kerala. The fast growth of the nuclear family system, the openness to the global system of the life, the approach to the new way of life i.e., the pragmatism and utilitarianism, the change in the morality and other values of life, etc… made more people to face the mentally illness. The world Health Organization had announced that approximately the two fifth of the Total population are facing this illness. So there are persons who live in the houses, alienated, separated, unwanted and without any support. There are a many people who have no abode and caretaker. The social stigma prevailing among the so-called literate and well educated Keralites does not allow the people to make marriage relations and any other sort. Not only the ill persons but the whole family itself has to face these situations very cruelly. It is due to this identification, the founders erected this institution on the ground that the ill persons were burden to the family. So the founding of this institution is important for “a decent living” of the mentally ill persons.